Tralee Dynamos; Philip Evans, Dylan Curtin(2),Eric Son(2). Cork City 3-0 Kerry DL . Castleisland Afc 3-0 Killarney Athletic . Tralee Dynamos; Adi Cenali, Dylan Curtin . 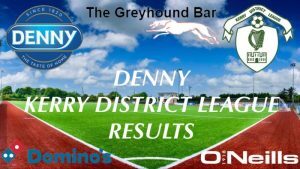 CS Abbeydorney 1-0 Lenamore Rovers . CS Abbeydorney; Stevie O’Sullivan . Classic Fc A 3-0 Ballybunion Fc . Kilmoyley Athletic; Daniel Collins, Jordan Brick (2). Annascaul Inch; Simon McCarthy (4). Rattoo Rovers; Cian Mcgrath (2), Nathan Mcgrath , Moss Dowling . Castlegregory Celtic; Darragh Butler, Steve Speirs, Damien Finn .